This is my go to brand ,i dont buy any other antiperspirant. Its effective and keeps me dry all day everyday. My Night and Day shining Armour! Dove products have been my savior. 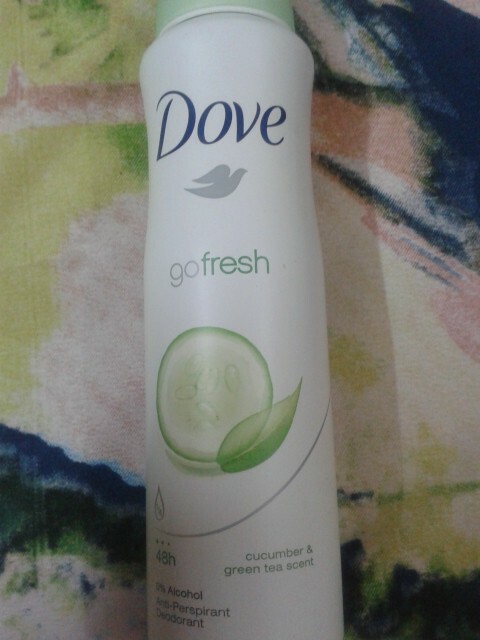 Been struggling with my normal deodorant lately it doesn't keep me fresh anymore so now i just spray Dove and i could carry on running my errands without having to refresh all the time. Love it. I simply luv all dove products, the deodorant leaves ur under arms feeling fresh,silky smooth and soft all day long, its affordable and totally worth the price. I love it!.. It keeps me fresh all day and that's quite commendable considering this on going heat wave we're experiencing in Durban... I love the scent, not overpowering but on point! Leaves you dry and feeling fresh all day long!! This Deo is fresh and dry, I love the softness and the smell - like baby powder! Dove deodorant is effective at doing what it should and gentle on your skin. This is a keeper in our family! I have always used roll-on under my arms and since trailing this, I've never used anything else. Well done on convincing me to use Dove deodorant spray. Dove honestly lives up to its promise - 1/4 moisture so gentle on my skin. Leaves me fresh all day and no white marks on my clothes. You can't go wrong with this brand. This is the only deodorant I ever use. I lead an active lifestyle, and Dove deodorant is the only one that keeps me feeling fresh. I love the smell of the original version, and it is very gentle on the skin. The spray isn't cold (can't deal with cold deodorant in winter!!! ), it doesn't sting and it feels hydrating. I will never use another brand! I never knew that a deodorant could be so effective. I'm always on the looking out for anti-antiperspirant that keeps me dry all day. Dove has done it for me. I've even bought if for my daughter as it is very soft on the skin. Tried this product, it was very smooth and had a pleasant smell, diffidently moisturized my underarms, and did not burn or cause irritation ? Best long lasting deodorant !!!! I have used this product for a good two weeks and i must say it works miracles. My under arms smell so good and it literally lasts for over a day, and leaves them soft. I would recommend this product any day. This is the only antiperspirant I trust. It's long lasting. It works for my busy life and doesn't fade away throughout the day. Plus it smells great. The only con is that it leaves a white residue. But i cannot live without this antiperspirant- my holy grail. 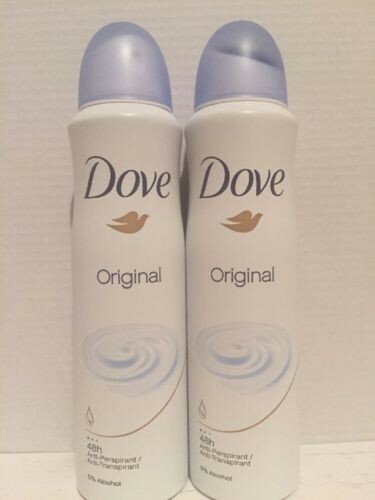 I will always LOVE the original Dove products - The smell is absolutely heavenly! - Clean; fresh and just SO DOVE! :) I can constantly smell the freshness it provides, throughout the day. This product also lasts quite well over a normal 8 hour working day. Since Dove came out the first time I was a huge fan of it. And it's no different to the deodorant. 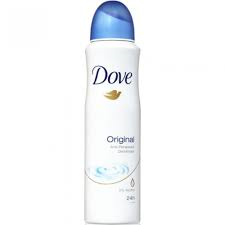 Dove deodorant is one of the very few that works from the time you spray it on to the time you go to shower. I never have to worry about having a slight smell of sweat. I give this 5 stars, the only sad part is for a good product you pay a bit more. You only need to spray it on once a day after a shower and it will keep you from sweating and feeling uncomfortable all day. I personally tend to sweat easily if I'm not using the correct underarm spray (I don't like roll on, as its sticky and leaves you feeling wet once applied) but with Dove deodorant I never have a problem and it feels great to go through the day. It is a bit pricey if compared to roll on's and other deodorants but are always on specials and have great combo deals available month to month. Definitely a must have from me! My favorite deodorant , I started using this after I was so impressed with the quality of their roll-ons. Its keeps me dry all day and leaves my skin so smooth . Its not badly priced. They all smell amazing , I have tried every single variant . Will never stop buying this ! Trends come and go and so do my beauty products, but the one item that is always here to stay is my Dove deodorant. I love how long lasting it is, the familiar and comforting scent and not to mention how freely available it is. For some reason I always have a dove antiperspirant spray in whatever variant on my dressing table and in my handbag. Just something about Dove that makes us feel confident and dry. That reassurance that you can go through the whole day without worrying about the pits at all. For some reason, I prefer antiperspirant deodorants over luxury price. Something as fresh smelling as the Dove Original Anti-Perspirant Aerosol is perfect to get me through a day of work. I can count on it to prevent unwanted B.O and I also love the moisture that is provided with each spray. Definitely a must-have, after-shower product! The pink Dove roll-on is my Holy Grail. I can't imagine myself using any other brand. I always end up coming back to this. Totally in love with the smell. Dove are my best brand of deodorant - I only use the sprays, and my favourites are the Invisible and the pink Beauty one. They smell amazing, and really do a wonderful job, plus they don't irritate my sensitive skin! Love all my Dove products but especially can't go without my Dove deodorant. I have all the variants & they all smell lovely. Keeps me smelling clean & fresh all day long. You can't go wrong with Dove. Highly recommended. I decided to give aerosol a break due to the amount of metals,chemicals and of course to give the environment a small break.However I still had the problem that all roll ons I've tried left my underarms wet and just so uncomfortable. This week I tried the Dove Silky dry and it really does dry faster than the others and better than that,it has an delicious scent that stays on for many hours. I am a HUGE fan of Dove, in general. But this is one product that no matter how many deodorants I try, I come back to. The scent is flattering to any woman and smells so clean and feminine, it also adds moisture to your pits so you don't have that terrible dry and itchy skin after shaving and the best part is - IT LASTS ALL DAY! I keep several of these around; car, handbag, bathroom, bedroom, etc as I love the smell and makes me feel so refreshed! This is so gentle and effective. No more white marks under your arms anymore. I love Dove! It is soooo awesome and I mean all their products (well the ones I use anyway). The deos work all day and night (party girls) and it smells great too. I recommend it to everyone! Great product, would definitely recommend for underarm bumps! I began using this product just before summer and after three days of using this deodorant, I began to notice a change. Within a week, my underarms felt softer and smoother and lighter. No residue on clothes and very mild on sensitive underarm skin. I absolutely love this deodorant. I used to buy another brand for years but now I am hooked here. Dove deodorant is great stuff and this variety is no exception. I love how smooth it goes on, the fact that it moisturizes, and for someone like me who epilates I find it to be incredibly soothing. My underarms are one of the few places I don't get irritation bumps post-epilation and I attribute that to my Dove deodorant. I can't say enough good things about this product! Ill continue using after pregnancy for sure.